The Spearing is one of if not the most populous fishes in our states's bays and marshes. Their habitat is predominantly near the water's edge. They are mostly found swimming in brackish waters, such as in the mouths of rivers and streams that connect to the ocean. These small schooling fish rely on grass beds, which provides the nearly defenseless fish some form of shelter from predators as well as provide safe haven for spawning. During the summer, most are found in the shallows along the shoreline rarely in water deeper than a few feet but will descend to greater depths in the winter to avoid the colder temperatures at the water's surface. Atlantic Silversides are small, rarely exceeding 6 inches long. Females are generally slightly larger than males. They have a short head, large eyes, a small, toothless mouth and a slender body with a rounded belly. The upper portion of their body is grey/green in color with a translucent to white underside. 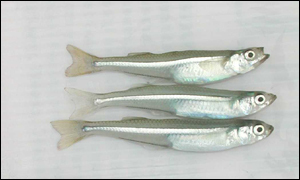 The Atlantic Silverside takes its name from the metallic silver band or stripe that runs along both sides of its body. It's appearance is much like that of the bay anchovy but has a much smaller mouth. Silversides breed from May to July in conjunction with specific moon cycles. During the full or new moon and the highest of the high tides, they gather in large schools to scatter their eggs along the sandy bottom of the Estuary. The eggs hatch in about 5 to 20 days. The temperature of the water (warmer water = quicker hatching) determines how many of the larvae will become male or female. Cooler water results in more females with warmer water temperatures resulting in more males. The lifespan for Atlantic Silversides is short at 2 years the most Most die after they spawn at about one year old. Spearing are known to be excellent fluke bait. They do not live long out of water and are not typically used as live bait but that does not diminish their effectiveness. Many of the NJ Party Boats that specialize in Fluke always have spearing available whether it be frozen or fresh. They are also excellent baits for snapper blues when the young blues are prevelant in late summer. Spearing also make a great chum for larger game fish. Their numbers and small size make it easy to chum a handful at a time to keep a steady stream flowing. Catching your own spearing for bait is quite easy. And they are easy to store in your freezer. Just put them in a zip loc package and they will be set for you for months. All you need is a net and access to the water. Using an umbrella net is the easiest way to catch spearing. It can be done alone and is as simple as dropping the net to the bottom of the water and then after a period of time, pulling the net back in. Since you will be using the net in very shallow water (4 feet or less), this is an easy and simple process and a good way for kids to be involved. Watch this video for a quick intro. Learning to throw a cast net properly is a learning curve and not the easiest way to catch spearing. However, it can be done. If you do want to use a cast net for spearing, you need to make sure you have a very fine mesh (3/16" or smaller) otherwise many will escape and/or be gill netted. You will need the help of another person to do this but also quite simple. The idea here is that you and a partner drag a net along the bottom of the water catching any fish and other marine life swimming by. This is a lot of fun for kids to do in the summer.